On February 25, 2014, the Town Council the Town Council passed a resolution designating Bridgewater as a Purple Heart Town. The verbiage of the resolution follows below. 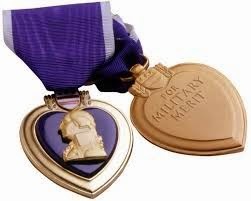 Bridgewater has committed to recognizing August 7th each year, as Purple Heart Day, in honor of the men and women who have been wounded or killed serving and protecting America and our freedom. In response to Bridgewater’s continued commitment to our veterans, the Town will be recognized for joining in this effort. A service award will be presented on Thursday, October 16th at 11 AM in the Town Manager’s Office located at 25 South Street in Bridgewater. All are invited to attend. NOW THEREFORE BE IT RESOLVED: That the Town Council of the Town of Bridgewater hereby proclaims the Town of Bridgewater as a Purple Heart Town honoring the service and sacrifice of our nation's men and women in uniform that were wounded or killed by the enemy while serving to protect the freedoms enjoyed by all Americans, and that August 7th of each year be recognized as Purple Heart Day.